Prize Hub is a redemption machine from BayTek. 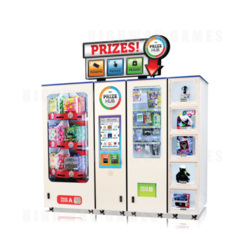 This redemption machine offers flexibilty in prize variety and capacity for operators, with the benefit of containing a user-friendly menu. Players can use the intuitive 22" touch screen to choose and claim their prizes. Each machine can also be connected with up to two each of the Capsule, Spindle or Locker hubs to expand its potential. Prize Hub LIVE is an online portal that allows operators to analyse and manage their Prize Hub machines remotely and in real time via a computer or mobile. Operators can check inventory, change ticket prices, and upload prize images and quantities remotely. Prize Hub LIVE also alerts operators or issues via text alerts or emails, and operators can test the printer, vend prizes and monitor the status remotely with diagnostic features.